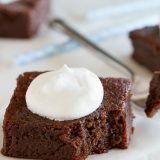 These moist, dense and fudgy Coconut Flour Brownies will convert you even if you aren’t grain free! Dairy free option is also included. I often realize just how lucky we are that we don’t have any food allergies or intolerances in our house. 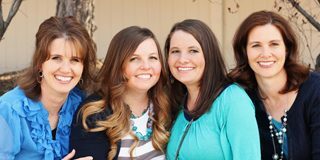 I know a lot of families that have to alter diets and cooking styles to deal with different conditions. Because we don’t have any diet restrictions, I’m not used to cooking or baking for people who do have those restrictions. Every once in awhile, I’ll volunteer to bring a meal to another family, and every once in awhile, I’ll be faced with one of these allergies or intolerances. So, while I don’t have to bake grain free on a normal basis, I’m always willing to practice up whenever I have the chance!! 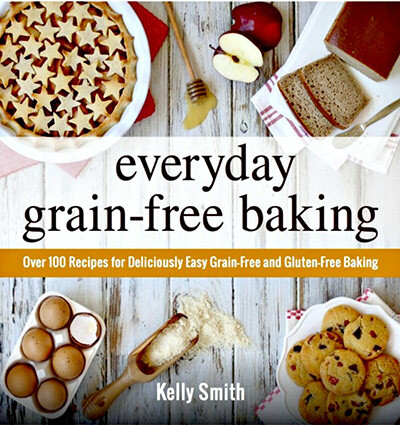 And I was given the chance with this cookbook, Everyday Grain-Free Baking by Kelly Smith. I’ll admit that I went into this cookbook with some prejudices, not being very familiar with grain-free baking. I thought it would be full of ingredients that were hard to find and hard to say. 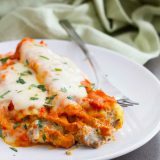 But I was wrong – the recipes do rely on different types of flour besides all-purpose, such as almond flour and coconut flour, but for the most part, most of the ingredients are very normal. 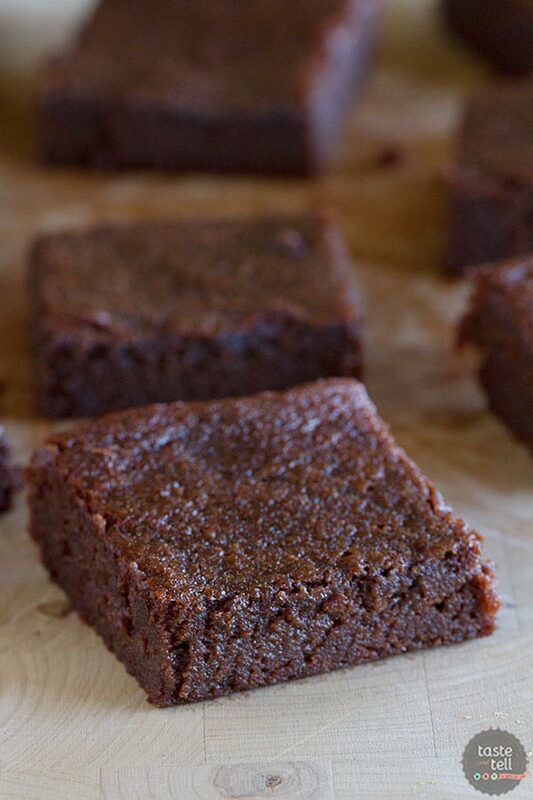 In fact, for these Coconut Flour Brownies, the only ingredient I didn’t already have on hand was the coconut flour. The book has a wide variety of recipes, everything from bread to breakfast to pies and cakes and brownies and cookies. 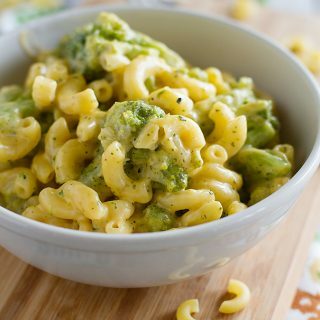 I also love that even though it’s a grain-free cookbook, there are also dairy free recipes, recipes with dairy free options, egg free recipes, nut free recipes and recipes suitable for the Specific Carbohydrate Diet. Each of these are designated on the recipes that they apply to. Number of Photos: many Looking through the book, it feels as if there is about one photo for every other recipe. The photos are very well done and are great at showing what the final recipes will look like. Difficulty Level of Recipes: medium Really, I think most of the recipes in the book fall between easy and medium, but since it’s a baking book, the recipes may be a little more difficult for some. And if you aren’t used to baking grain free (like me) there might be a small learning curve to learn any differences. Availability of Ingredients: easy This is the thing that surprised me most about this book. Today, you can find almond flour and coconut flour at most grocery stores, and most of the other ingredients are pantry staples for me. 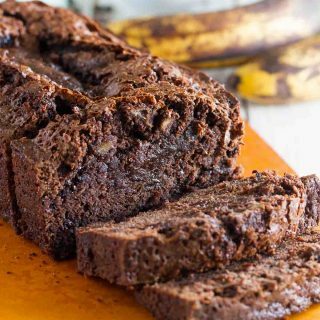 Buy Everyday Grain-Free Baking on Amazon. While trying to decide what to make, I wanted to try something that would be good to take to neighbors, if needed. 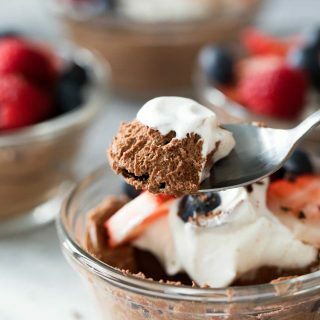 I was drawn to many of the recipes with fresh fruit that is not in season, so I have a lot of recipes to try this summer, but in the end, I decided that you can never go wrong with chocolate! I have never used coconut flour before, so I didn’t really know what to expect. The recipe was fairly simple to prepare, but when the brownies came out of the oven, I had some doubts. They didn’t really look like brownies when I first took them out – they looked more like a cake. But I carried on. And when I took them out of the pan to cut them, I no longer thought they looked like cake. And when I took my first bite? I was totally blown away. The taste and texture were totally not what I was expecting, but they were so good. The texture wasn’t gooey like a normal brownie, but they are dense and rich and I would still call them fudgy. They had a hint of coconut flavor to them (they do have coconut flour, coconut oil and coconut milk in them!) but the chocolate really shined. In the book, there is a recipe for whipped coconut cream, which I wish I would have prepared for. Your coconut milk needs to be refrigerated overnight, and well, I wasn’t prepared. So since I can 😉 I just whipped up some fresh whipped cream. 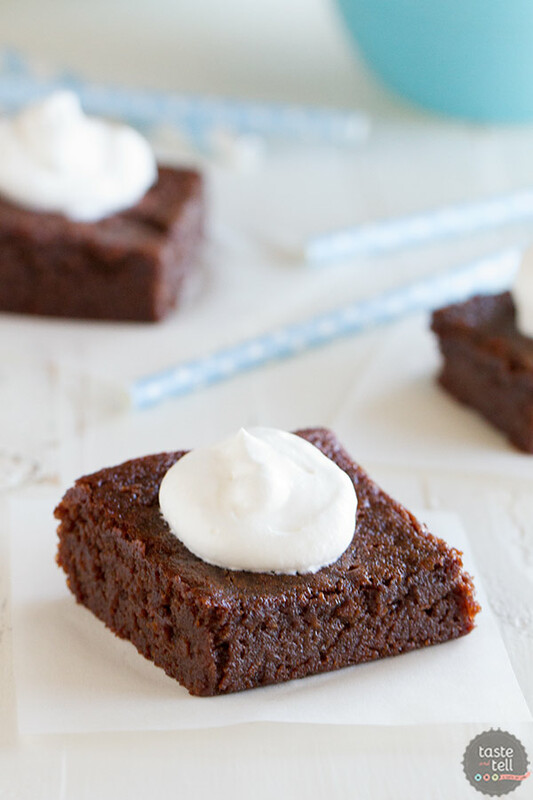 These brownies were so good that I would make them again even though we don’t need to bake grain-free. And bonus is that they saved well, too. They were perfectly moist and delicious 2 days later, which is definitely a plus. I’m so glad to have this book in my collection! Preheat the oven to 350ºF. 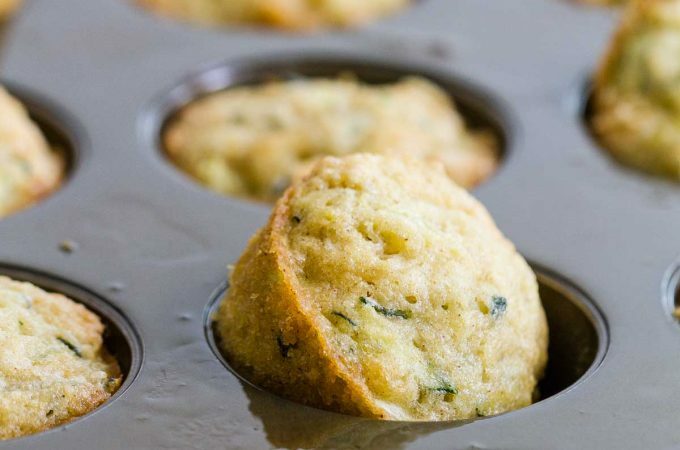 Grease an 8×8-inch baking dish, or line with foil or parchment paper. In a small bowl, mix together the coconut flour, baking soda and salt. Heat the coconut oil and butter in a small saucepan over low heat until melted. Add the chocolate chips, cocoa powder and honey. Stir the mixture until the chocolate chips start to melt, then remove the pan from the heat and stir until the chips are completely melted and the mixture is very smooth. Set aside to cool. Whisk together the coconut milk, egg and vanilla in a large bowl. Slowly whisk in the cooled chocolate mixture. Sift the dry ingredients into the chocolate mixture and whisk vigorously until no lumps remain. Allow the batter to rest for 5 minutes so that the coconut flour can absorb some of the liquid. Pour the mixture into the prepared dish. Bake for 25 minutes, or until a tester inserted in the middle comes out mostly clean. Remove the dish from the oven and allow to cool completely before cutting into squares. I really appreciate any recipe that doesn’t need a gluten free flour mix, I love just a coconut flour. Thanks for sharing! We love brownies of all kinds in my house! 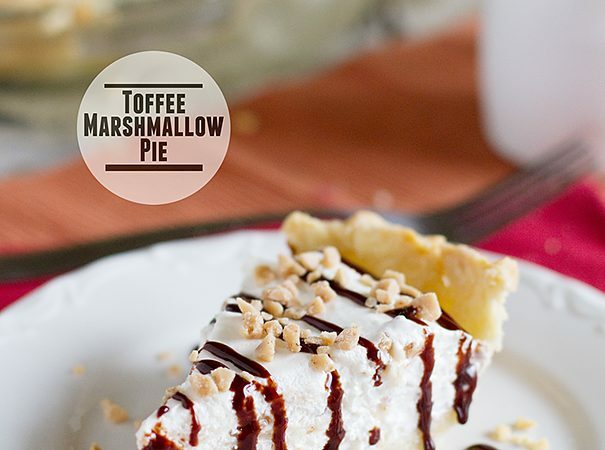 These look so moist and delicious – I can’t wait to try them! Any kind of brownie is a yummy and delicious brownie! 🙂 Love this! I have a few friends who are GF and I never know what to bake for them! Or at least, what to bake for them that I can trust won’t turn out looking (and tasting) like a hockey puck. 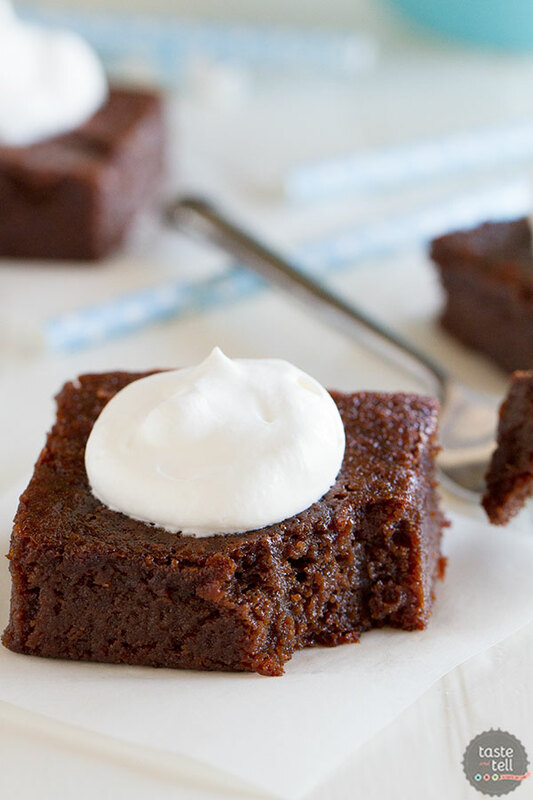 Need to get my hands on this cookbook and these brownies into my life! For the coconut milk do you use canned or the liquid refrigerated kind? You use canned coconut milk. Can I use olive oil instead of coconut oil and regular milk instead of coconut milk?? I have not tried either substitution, so I’m not sure. Sorry! My husband is on a sugar free diet and also on a no Vitamin K diet. Are the coconut items O K?? They sound delicious! Do you know how many calories are in these brownies? 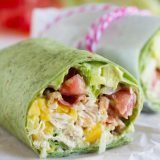 I don’t calculate the calories, but it’s pretty easy to do in sites like caloriecount.com. I used almond/coconut milk and added two teaspoons of Nutella. They came of delicious! LOVE the addition of nutella! 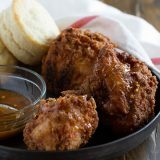 I must say this recipe rocks! I made these 2 days ago. I have type 2 diabetes, and one serving (yielded 16) did not spike my BG at all! I followed the recipe to a “T” the smell in the kitchen was just out of this world! I used all organic ingredients, I replaced the honey (i didn’t have enough!) with 100% organic amber maple, and added ~1/2 cup walnuts. You definitely have a winner…my wife loved them, and it takes a lot to impress her…she is an amateur dessert critic!! ;o) Thank you for sharing! all I need now is a coconut flour pancake recipe to supplement these! LOL. Those look scrumptious! I don’t use coconut flour often but I’d love to try these, since they’re so healthy. Wow…that looks fantastic. So dark and almost caramely. I bet the taste is out of this world! What if I will try this at home with coconut flour in Organic coconut oil. Thanks for sharing! Made these tonight! Wow!!! They are delicious! My husband and sons devoured them quite quickly. I’d say this is definitely our go to brownie recipe from now on 🙂 I did have to add 8 minutes to the cooking time but they turned out perfectly. I’m so happy you loved them! I also added 7-8 min to the cooking time, but the taste is great! Texture of mine was slightly different looking than the pic, but delicious all the same. My youngest son has celiac so it’s nice to find decadent desserts for him to eat 🙂 Thank you! Can I use Swerve instead of the honey. I am doing a keto diet. This is my question as well! Did you ever try it with Swerve? Try Lakanto Maple, I use it for honey/maple in recipes for my keto diets, Thinking some walnuts/lilly or a broken up lakanto bar instead of the chips and some chopped walnuts to up the fats…….tempted to coat with avocado/cocoa icing with swerve in it. ONE THING bugs me about this….I need grams or my OCD will not even let me attempt a recipe…coconut flour is notorious for being very picky. I made these today and they were amazingly delicious. In response to the lady who asked if you could use regular milk instead of coconut milk, the answer is yes. I used regular milk. I also substituted the semi seeet chocolate chips with Lilly’s low carb chocolate chips. They still turned out perfect! I’m so glad they turned out well for you! Look amazing! I have been looking for a “go-to”brownie recipe. Hope this is it!! Can’t wait to try!! Has anyone tried it with a granular or powdered sweetner instead of honey or Lakanto maple syrup? I have made these brownies at least five times now. This recipe works every time. I made it exactly as written. I have also made it with extra cocoa powder, and both were delicious. It just depends on your chocolate cravings! They have a delicate texture and are very moist. They are a great paleo snack. My husband loves them too.